This was a well-attended session moderated by Drs. Kenar Jhaveri (eAJKD Blog Editor) and Laura Maursetter. Room 107 was filled to capacity and the organizers had to get an extra room to provide an On-Demand Session. Have exemplary cases and let those cases lead the discussion. I think this is very important especially in a subject matter, whereby the diseases are not very common and can have varied presentations at the outset. Each case of glomerular disease that we encounter in clinical practice, can have unique teaching points. Tackle physiology – the field is moving away from “idiopathic” term. Present and evaluate treatment data. Devote time to controversies/difficulties in the field. I have to say that I agree with one of the audience members who opined that Dr. Bomback truly gave a Masterclass. The second talk was led by the duo-tandem of Drs Robert Cohen (Beth Israel Deaconness Medical Center) and Jane Schell (University of Pittsburgh; also an eAJKD Contributor) who discussed “Practical Tips to Enhance Learners’ Communication Skills.” They gave a Master Teaching Map for Communication Skills. During this session, they used “role playing” to demonstrate how all of the steps below can be achieved. At the end of all of these, it is of prime importance to provide “feedback.” There have been several publications alluding to the importance of feedback, i.e., the learners perform significantly better, develop better judgment, learn faster, and they like it. In fact, in a study published in 1999, Hattie and Timperley looked at >500 meta-analyses, 450,000 effect sizes from 180,000 studies, 20-30 million students, with >100 factors influencing educational achievement, it was shown that “Providing Feedback, was ranked in the top 5-10 most powerful influences on achievement.” There are of course pros and cons to giving feedback, nevertheless, it is important for the learner to get it, whether positive or negative. In my opinion, it is in the delivery of the feedback that things can go either way. Then Dr John Mahan (Nationwide Children’s Hospital) talked about Integrating the Next Accreditation System into Clinic: Efficient Observation). He talked about Miller’s Pyramid of Clinical Competence and Bloom’s Triangle of Teaching through Competency. Karen Warburton’s (Hospital of the University of Pennsylvania) topic was entitled “There’s more to Nephrology than acute consults: Redesigning resident exposure to improve Nephrology Interests.” She talked about “Stimulating Interest in Nephrology,” which is the current focus of the ASN Nephrology Workforce Committee. One of the identifies problem is the flaw of the traditional nephrology rotation whereby students and residents are mostly exposed to an Inpatient Nephrology Consult rotation which significantly minimizes their exposure to more interesting and challenging aspects of nephrology, e.g., ambulatory nephrology, transplant nephrology, interventional nephrology, etc. She also talked about how other specialties are teaching some of our ‘bread and butter’ topics, such as fluids and electrolytes, being taught by critical care specialists/intensivists, etc. 1. Provide better exposure to a more broad, more interesting, more approachable, and less morbid view of nephrology. 2. Increase visibility of, and mentorship by nephrology faculty. 3. In doing so, provide a better understanding of what nephrology careers are really like. And what is the ideal rotation? She cites Jhaveri et al’s paper. 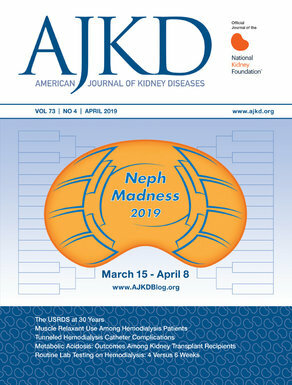 Box 1, Jhaveri et al AJKD, © National Kidney Foundation. 2. Include associated curriculum, scholarly pursuit. 3. Build mentorship during rotation. Overall, I thought this session was very useful. Personally, it validated my current methods of teaching our institution’s students and residents. Check out all of eAJKD’s coverage of Kidney Week 2014!